There are people in this world who are seemingly put here to inspire others and the Los Angeles Dodgers were fortunate enough to meet one of those people today. Anthony Robles, the much-heralded ASU wrestler who won a national championship this year despite being born with just one leg, had a room full of tough-guy big leaguers in awe this afternoon when he spoke to them before batting practice. 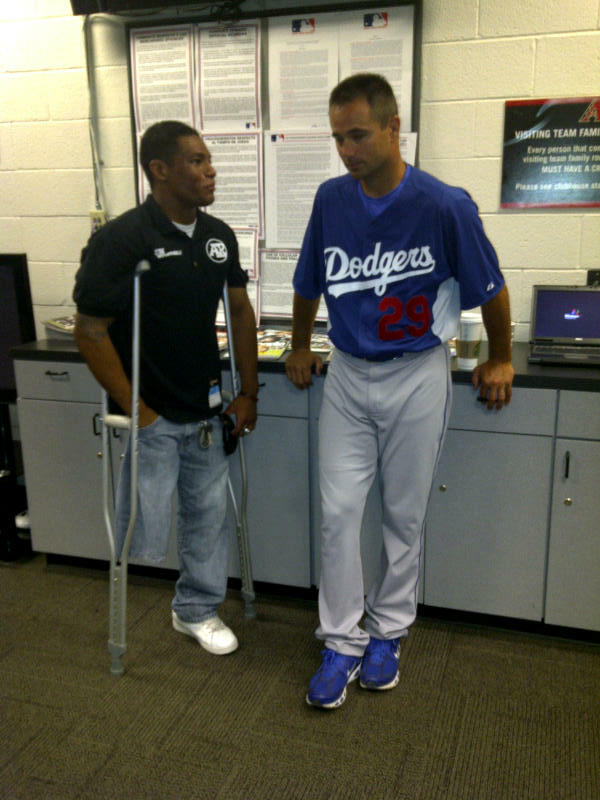 This came about after Ted Lilly saw Anthony’s story back in Spring Training. Anthony was not in town when we were here last month, but he was gracious enough to come by for the first game of the series and offer his inspiring words. His entire story was amazing, but you could hear a pin drop in the room when he finished his talk by reciting a poem he wrote and later read at the ESPYs. He finished his chat and nearly every player on the team came over to shake his hand or take a picture with him. It was a truly humbling moment for everyone in the room. Given that he’s now seeking to make a career as a motivational speaker, I jokingly told him afterward that it would help his cause if the Dodgers came out and won, 15-0. If we lost, we’d have to tell people he spoke to the team on a different day. Sure enough, in the third inning the Dodgers scored six runs, equaling their most on the season and had seven hits, their largest total in an inning in exactly two years. Suffice to say, he’s welcome back any time.